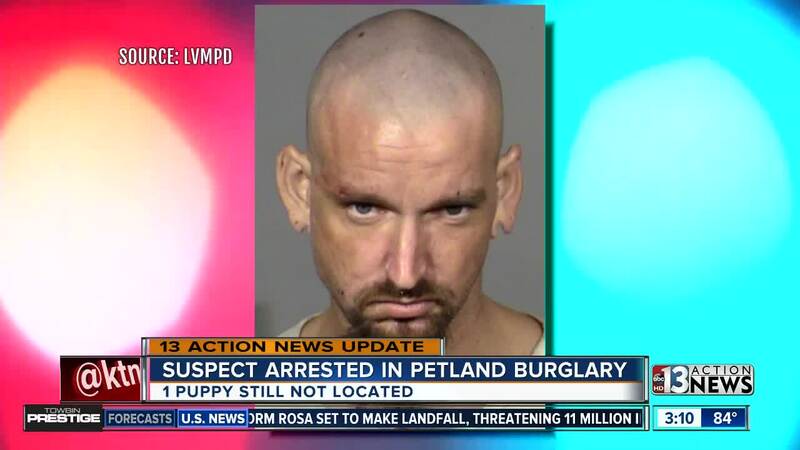 A man has been arrested in the theft of two puppies at Petland last week . Sean Ross faces charges of burglary and grand larceny in the incident Friday morning at the location near Charleston and Rampart boulevards. He was arrested Monday after North Las Vegas police received a call about a homeless man setting up a camp near a business by Decatur and Rome boulevards. North Las Vegas police then contacted Las Vegas police after identifying him. He had since shaved his head after the release of the surveillance video. Ross was taken to the Las Vegas Metropolitan Police Department Northwest Area Command for questioning, but he appeared to be under the influence of a controlled substance and did not provide any information about where the puppies might be located. The German Shepherd puppy has since been found and returned to Petland as of early Tuesday afternoon. The Pomeranian puppy remains missing. Detectives are seeking any information about the location of the missing puppies and ask anyone who may have unknowingly purchased either of the puppies to contact at 702-828-8577 or to remain anonymous, contact Crime Stoppers by phone at 702-385-5555.